The project proposes an innovative protocol for data dissemination over device-to-device proximity discovery. The protocol is developed on top of the LTE-Direct technology, but can be applied to every asynchronous communication in publish-subscribe paradigm and is intended for a particular scenario where a device (publisher) emits some information periodically and other devices (subscribers) can listen to it without any feedback. The main idea behind this protocol is to exploit discovery advertising messages for data dissemination to proximity listeners notwithstanding the length limitations that these messages usually have, typically for power saving motivations. 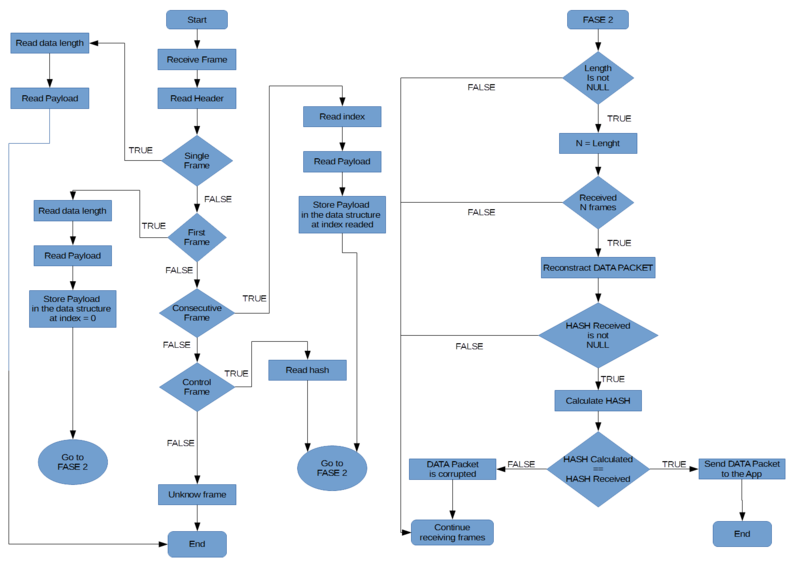 LTE Direct is an under-development D2D technology by Qualcomm that is part of the 3GPP Specification (Release 12) under the name ProSe. It utilizes licensed LTE spectrum for proximal discovery of devices/services. LTE Di-rect works seamlessly in collaboration with the regular LTE network: only a little amount of bandwidth (under 1%, exact quota depending on the implementation) is periodically assigned to LTE Direct for discovery actions. 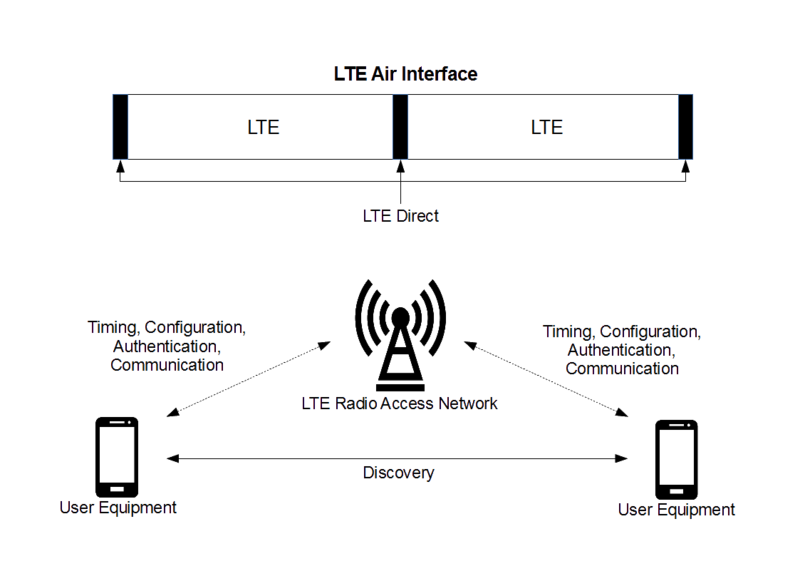 The “companion” LTE network is also used for the management of timing, resource allocation, and identification. In LTE-Direct, expressions are service layer identifiers and can represent an identity, a service, an interest, a location, etc. In the publish/subscribe paradigm an expression is what a publisher can broadcast (e.g., a device can broadcast an expression over the air for representing the information “we are a coffee shop”). METADATA extra data transmitted with the expression code over the OTA interface. 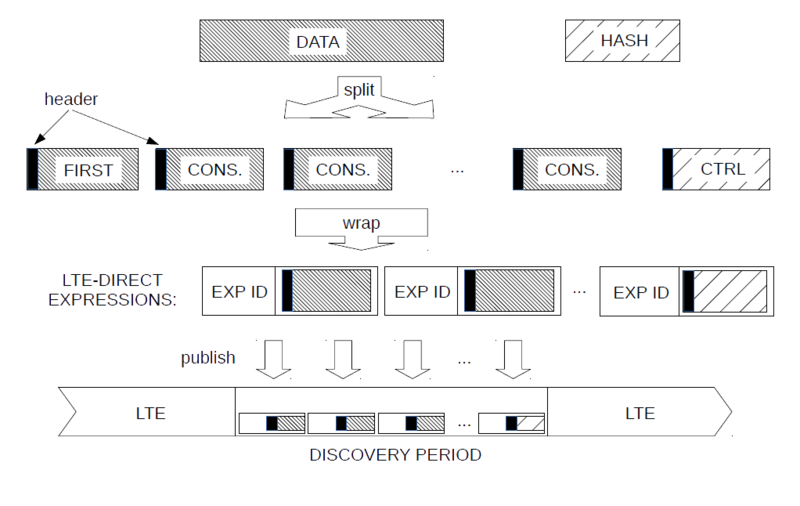 The multi-frame transfer protocol solution clearly separates the transmission layer represented by the underlying D2D proximity discovery technology and the higher layer where possibly long messages are managed; in other words, in a transparent way from the perspective of the application layer, our protocol is able to broadcast data with no length limitations over multiple discovery periods in an effective and efficient way. The characteristics and features of the proposed protocol, moreover, are designed to fit the requirements of application domains of emerging relevance in the field, such as vehicular data dissemination and coordination. In particular, consider a scenario where there are several LTE Direct spots along the way, which periodically publish useful information for vehicles passingby (e.g., traffic information or alerts in general). Our multi-frame transfer protocol can allow a vehicle to start receiving chunks (frames) of the information from one spot and continue receiving it from other spots, by seamlessly discarding duplicates and reconstructing the application-layer message even from multiple sources. CONTROL is a frame that contains a hash to evaluate the integrity of the information received. rebuild the original data bytes from the previous group of frames, verifying their integrity using the hash of the data. The publish and subscribe operations are technology-dependent, so to create a module “general-purpose” we created an interface for Android to be implemented with the instructions relative to the technology used. For this project we used the LTE Direct Trial SDK by Qualcomm Technologies, available for Android and iOS. This SDK allows the developer to access all the functionalities to create, publish, subscribe and manage LTE Direct Expressions. Within the SDK for Android is available an LTE-Direct simulator Android service that simulates the presence of the LTE Direct technology on the device where the service runs. The simulator allows configuring mobile devices connected at the same local network to see each other and communicates as if they are in proximity. For the subscription part the following schema summarize an alghoritm for the frames reception that allows the correct reconstruction of the original information also in presence of repeated or not ordered reception of the frames. 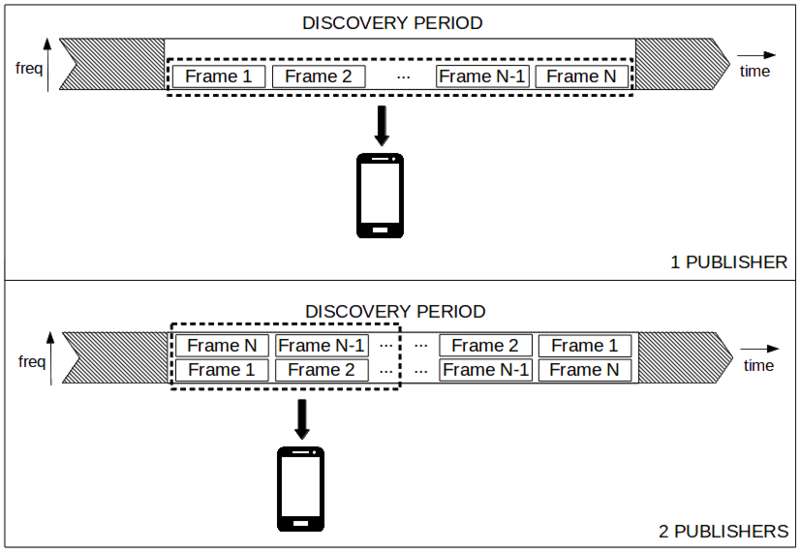 Alghoritm for multi-frame reception and data reconstraction. Other than code tests, we also used a testbet formed by three android devices connected to the same local network that executes the LTE Direct simulator service. Due to the execution on top of the LTE Direct simulator, the characteristics of the devices are not relevant. change of the data transmitted during the reception. 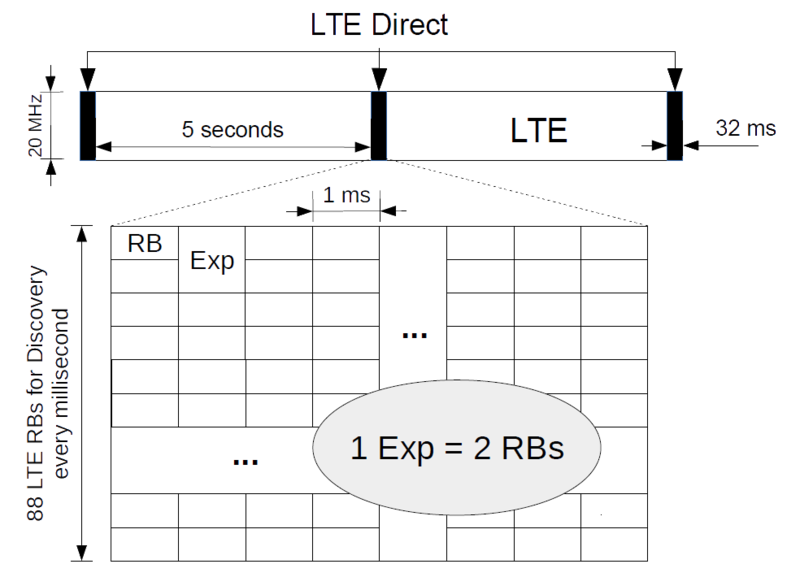 In addition, we also prove another feature of this protocol relative to the LTE Direct technology: the reception time can be reduced by transmitting the same data but with different frame order from multiple devices. Reception time halved by using two publishers of the same information with frames in reverse order. ... under development, stay tuned! Our Mobile Middleware Research Group activities focus on the study and development of support solutions for a broad range of scenarios in the context of mobile networking and distributed services. ranging on a wide spectrum of subjects dealing with the creation of novel solutions supporting the development of distributed services that can be classified in the following categories: Cloud Computing, Mobile Computing, Context-based Systems, NGN & Future Internet Scenarios, Sustainable Infrastructures for Smart Environments. For any suggestions, comments or further details do not hesitate to contact me.